This workout is considered a “Complex Workout”. 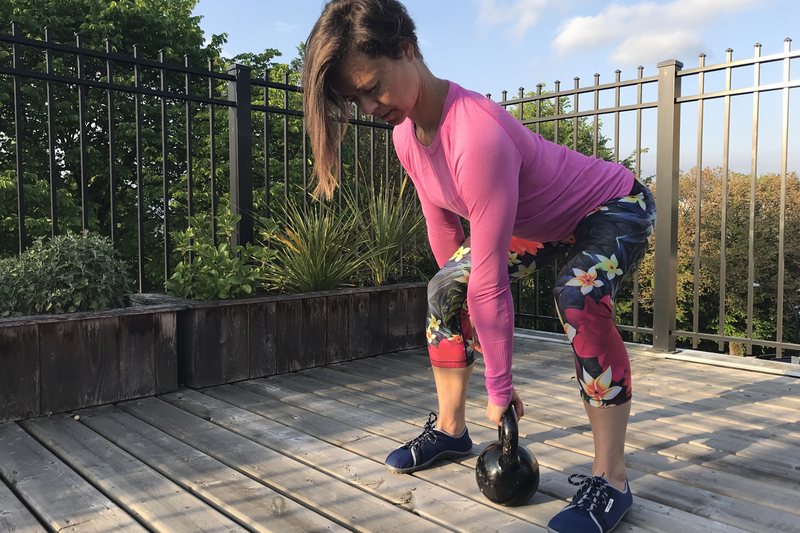 A complex is where you pick up a kettlebell, barbell or dumbbell perform several reps of an exercise with it, then move right into another exercise, then another, and another, and maybe one or two more. The first time I remember doing a complex conditioning? Well, that was the time I realized how quickly 90 seconds go by! I looked at the clock just when Nikki asked me “are you ready?”…..
It’s brutal. But guess what else? It’s also brutally effective for fat loss and improving your overall strength! Today Nik is sharing her “Go To KB Complex Workout” you can check out the whole workout HERE. On round one, perform 10 reps of each exercise, moving from one exercise to the next, never letting go of the kettlebell, never resting. Remember, you’ll finish all ten reps of each exercise before moving to the next exercise in the circuit. Loosen up! Your grip should be fairly relaxed. Think of your fingers as a hook and your thumb as a safety latch. 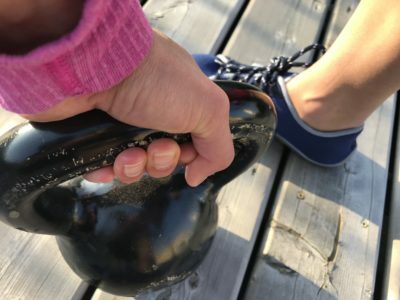 The kettlebell handle must be able to move within your hand. Complete 10 reps of each exercise without resting. Rest 90 seconds after the first round. Perform 9 reps of each exercise – rest 90 seconds. Perform 8 reps of each exercise – rest 90 seconds. Perform 7 reps of each exercise – rest 90 seconds. Perform 6 reps of each exercise – rest 90 seconds. Perform 5 reps of each exercise – Done! Try this complex this week. Just add it to your “off” days or cardio-only days. This is a great way to get your conditioning in! Live a Healthier, Happier & More Vibrant Life!